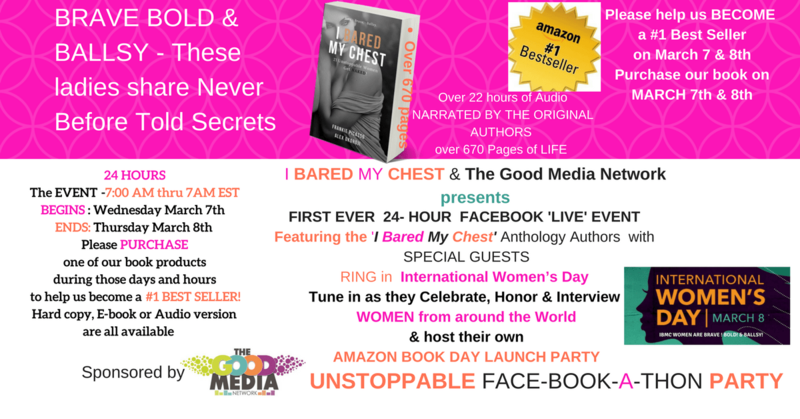 Make History with the authors of I Bared My Chest Anthology as they ring in International Women’s Day beginning at 7:00 Am est March 7 thru to 7:00 AM est March 8th, hosting the FIRST EVER 24-hour LIVE stream video on the Good Media Network Facebook Page. They will be Celebrating Women from around the World, and hosting their own Amazon Book Launch . I Bared My Chest is available in Hard copy, Kindle and Audio-book- Narrated by the authors themselves; and offers over 22 hours of listening pleasure! I Bared My Chest is also a first of its kind anthology, written by 21 women from 5 continents, diverse ethnicities, religions and sexual preferences.. Each of the 21 chapters covers LIFE, and the ladies reveal never before told SECRETS! Some chapters rival 50 Shades of Grey and make it seem as tame as a kitten at play!. The chapters are engrossing, inspirational and guaranteed to give the reader the opportunity of becoming free enough to be authentically who they are. With over 700 pages to its credit, I BARED MY CHEST is rich , meaty and so satisfying, a delicious meal to be savored, guaranteed to delight and fill your spirit. We are also raising one million dollars for charity – it is a good cause. Join us in our celebration of women Everywhere and listen to the authors as they discuss and interview women they admire from around the World. Learn how they have overcome hurdles to accept and love who they really are; without masks while baring their naked truth. MARK March 7th & 8th in your calendars right Now and help us become a Number 1 BEST SELLER..but Wait..Please don’t get your Copy of this incredible book UNTIL you hear us on the above dates. 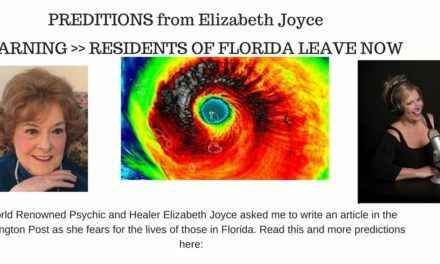 WORLD RENOWNED PSYCHIC HAS DIRE WARNINGS- GET OUT NOW! 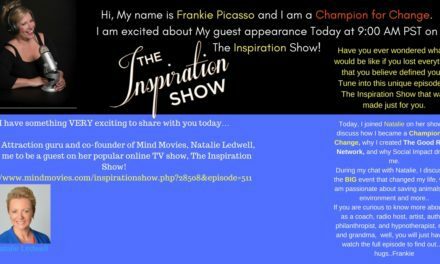 Look Who’s on THE INSPIRATION SHOW Today!!! TODAY’s the DAY.. I BARED MY CHEST IS FINALLY HERE!!! ©2017 The Good Radio Network. 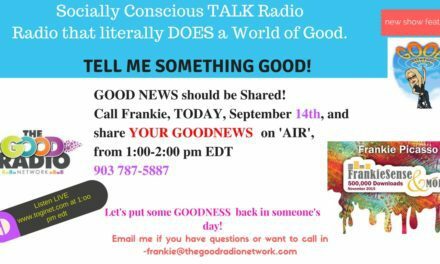 Designed and Hosted by Sanctuary Studios Inc.
Join our mailing list to receive the latest news and updates from the Good Radio Network.